Let's go fly on half of a VW engine. This is a 1/2 VW engine. That’s right, they cut the engine in half, cutting out the back cylinders and welded the case back together so only two cylinders exist. 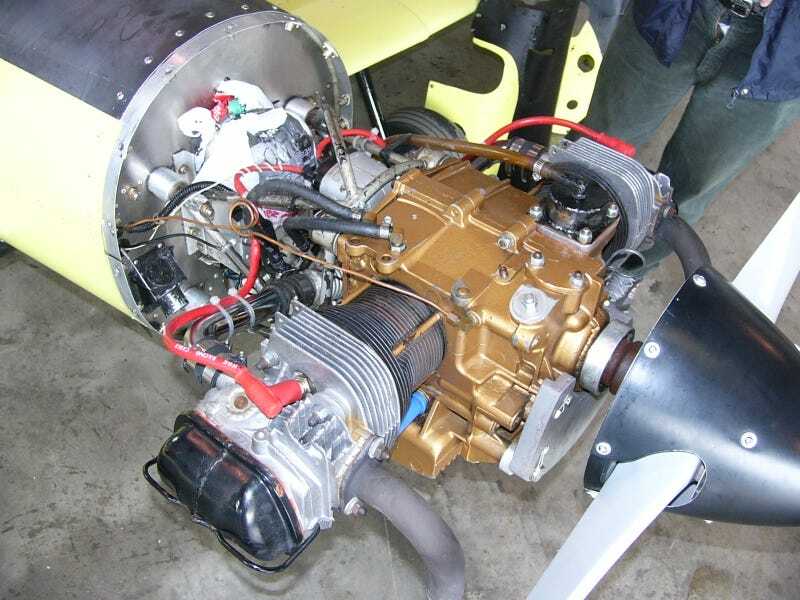 The purpose of such an engine is for ultralight or very very light aircraft, without spending twice as much money on expensive Austrian two-stroke power. “But, why?” you may ask. “Aren’t there other options already out there?” You may also ask that. Well, not without spending lots of money there isn’t, and the weight isn’t all that bad in the end! This is basically an air-cooled VW beetle engine. Once the job is finished, the whole engine ready to fly weighs about 85 pounds. For those efforts, you have about 35hp@3,500 rpm. But, that’s not all. That’s the basic engine. We can build this up to 1200cc and 45hp with reliability, for about the same weight. It’s all displacement. This engine is in the same class as a Austrian Rotax engine that weights slightly less but also costs quite a bit more to run. It burns more fuel per horsepower, consumes added oil, has an overhaul recommended every 300 hours, (The VW hasn’t discovered how long it can run, some of them have gone 1,500 hours and run strong.) And has widely available parts for not much money at all. Now there are less complex ways to do this without cutting and welding the case. It’s actually a magnesium case so cutting it and all of that work only saves you five pounds more. the true weight of a VW is the cylinders and heads and pistons, etc. Cutting those out of the equation take lots of weight off but what you’re left with is just two cylinders of a flat-four and it is balanced. they truly work in boxer fashion, out together-in together. any case pressure changes from that are taken care of by a pressure check valve so oil is never pumped out of the seals. Have a good look around one on a test stand. sounds buttery smooth. So what’s it used for? Well, ultralights and small single-place planes. All single place planes really. Let’s start REALLY small with the Legal Eagle. Weighs 244 pounds. Talk about cheap flying. TEAM mini-max, again very similar to the previous few. this is seriously cheap flying, especially if it’s an actual ultralight where you don’t need a pilot’s license, just a few lessons.